« Two New Books! Donations to NAL! A roaring Fire is exhilarating. Flames dance and heat reaches out to caress. The colors move through scales of orange and red, the white of pure intensity and the vibrancy of color gives way to the charred blackness of ash and soot. When we place the action of this Fire on our desire and will, passion flames and the urge to do, to act is fueled by the intensity of its need for change. 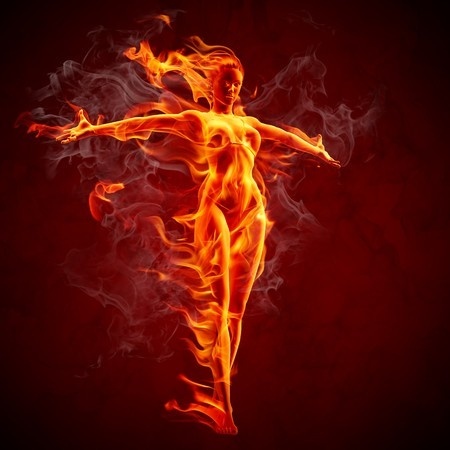 Fire courses through our bodies as the electrical charges that provoke immediate response to pain or pleasure. Our bodies heat as we exercise and move and the fires of digestion break down the food we take in as sustenance. Anger rages hot when we are challenged and confronted and the fire of desire takes hold when attraction draws us into lover’s embrace. Fire blazes its way through our world in the form of communication, electrical wiring, technology and more. We are surrounded, permeated and interwoven into the inferno that excites and calls us to express ourselves and the will we have cultivated. To work with the energy of Fire is to invite radical change and irrevocable transformation. Let’s take a look at is many forms and areas of impact. FIRE, unlike the other elements cannot exist in physical form without consuming and destroying something else, thus causing transformation of that thing. It is out of that destruction that the potential for the most growth often occurs. This action is that of the legendary Phoenix rising from the flames of ash. In magickal practice, Fire represents the state of action and the fires of will. We call to the energies of Fire to stir the flames within as we aspire towards integrating our will with that of our Higher Self. At a spiritual level, Fire carries the seeds of transformation that are the stuff of initiatory change, action and development of the Higher Will. At a purely mundane and physical level Fire is associated with heat. The warmth of the Sun and the heat of the wood stove that keeps us warm in wintry weather. When we take it to the mental level, Fire becomes the passion that excites and ignites. It is the catalyst that creates movement and it is the creative spark that leads to new invention or manifest creation. Energetic workings and practice are vital to keeping the internal will enlivened and ready for action. Fire is the flame of will, desire and intent. It quickens and catalyzes in its expansive form and destroys and removes in its nature of contraction. Many years ago I came across these Universal Laws as they relate to the four basic elements. It may seem odd to equate the elements as following certain “Laws” particularly in the semantics of that word and its normal connotation. But, everything must follow some sort of order and structure to be successful; albeit, sometimes that order appears to be the most disordered mess, it is still order nonetheless). This is also true of magickal workings. There are specific laws or rules (whatever word you prefer) that govern the order and structure of the Universe and its workings. These are but a few of those and I offer them now as food for thought as you move through each of these elements. Some are overt in their relationship to a specific element and others are a bit more occult (hidden) in their meanings. When we speak of polarities, there are many different examples that could be given; male and female, light and dark, negative and positive to name a few. When we perform magickal workings we draw upon the nature of the polarities to bring a state of action to that working. If there were no darkness we would not know how to define the light. If there were no negative action, the desire towards the positive would be non-existent. The element of fire is aptly described by this Law as one of its primary functions is to stir up, to excite, and thus to transform and potentially transmute that which was being worked upon. When we call the energies of Fire into our workings, we are automatically putting in place the potential for action to occur. We are forcing ourselves to move beyond a place of inertia and undefined focus of intent to catalytic change that will be either the positive or negative charge that is needed for desired outcome. This is the natural by-product of working within the realms of polarized action. For every action, there is a reaction. Thus, for every cause there is an effect. The measure of that effect is usually in keeping with the amount of will exerted, although the comprehensive out-picturing of that statement is not always apparent. This is typified in the cautionary advice to be careful what you wish for. Spend a few minutes each day outside in the sun. As you sit facing the sun (be sure you have on sunscreen and limit to no more than 5-10 minutes) close your eyes and allow the warmth to penetrate your body. Imagine being filled with the radiance and strength of the sunlight and feelings of renewal at every level of being. Engage all of your senses in the experience of being bathed in the light and energy of the sun’s rays. Step into the shade and make note of the difference in your physiological response. And, then step back out into the sunlight; making note of the difference of experience. Thanks so much! There is such beauty and serenity in the heart of the flame. Beautifully written, the poem and the photo only add to the feeling for fire. I m a fire sigh and I love fire of any sort, bonfire, candle flames, the flickering dance, the wild flare as flames leap to the sky. I also have a healthy respect for the destructive nature of fire and for its power of transformation.